Fully featured and focused on utility, this H2No® Performance Standard 2-layer shell jacket has an articulated fit for freedom of movement and a smooth mesh liner for comfort and ease of layering with a more tailored silhouette. Throw Aspen’s steepest, Mammoth’s sickest and Revelstoke’s rowdiest at the Snowshot and it slips through it all like a local heading to a secret stash. Our motion-friendly Snowshot delivers superior comfort and mobility when you’re ripping the park, charging powder in the trees or dropping into fresh steeps. The fabric package includes a burly, H2No® Performance Standard, 2-layer polyester shell with a waterproof/breathable barrier for storm protection and a DWR (durable water repellent) finish to keep you dry when you’re flying through mucky weather. Lightweight, slick mesh lines the body and sleeves to wick away moisture and provide a smooth glide over layers. Articulated arms let you move naturally, and pit zips offer up a quick-venting option when you’re working up steam. 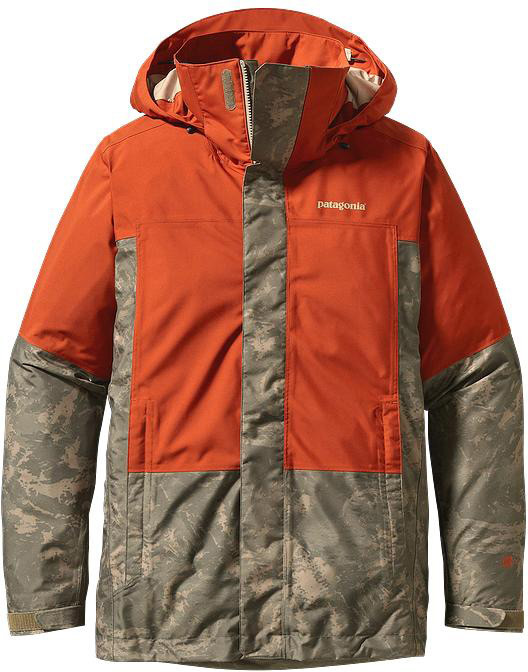 Weather-sealing features include a removable, 2-way-adjustable, helmet-compatible hood with a laminated visor, soft microfleece panels at your neck and chin to protect from wind blasts and a low-profile powder skirt (with webbing loop that connects to any Patagonia® snow pants) that provides an always-ready seal when you’re in the deep. Zippered pockets: two handwarmers, one chest with secure media pocket and cable routing and two internal pockets for goggles and gloves. With an embedded RECCO® avalanche rescue reflector.